Great Impressions: Blessings Abound during Release Week! I just love Release Week! Lots of inspiration and fun stuff! I'm waving today from my hotel in Burlington, NC. Hubs and I are on a business/pleasure trip. This week I have been thinking about how blessed I am to be able to work and play with truly wonderful people...and wouldn't you know it, Great Impressions Stamps had the perfect stamps for me this week! 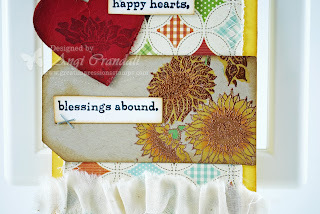 Can you see where else I used the Sunflower Background stamp? Look along the top edge of the tag. This time it's stamped with Versamark and then embossed with clear powder. Love it! The Blessings (D452) sentiment is also part of this release and just what this tag needed. I forgot to write down what paper I used, but I think it's a Simple Stories line...added a little torn muslin and a few tiny staples and ribbons to finish it off. I think I may have to make a few more of these along with a few loaves of something yummy. Are you in the baking mood? Fall is in the air! This is so me Angi! I love your sentiment placement with the staples and the sparkle in your flowers - great tag! Angi, love how this tag just flows with color and dimension. Such a great sentiment, too! 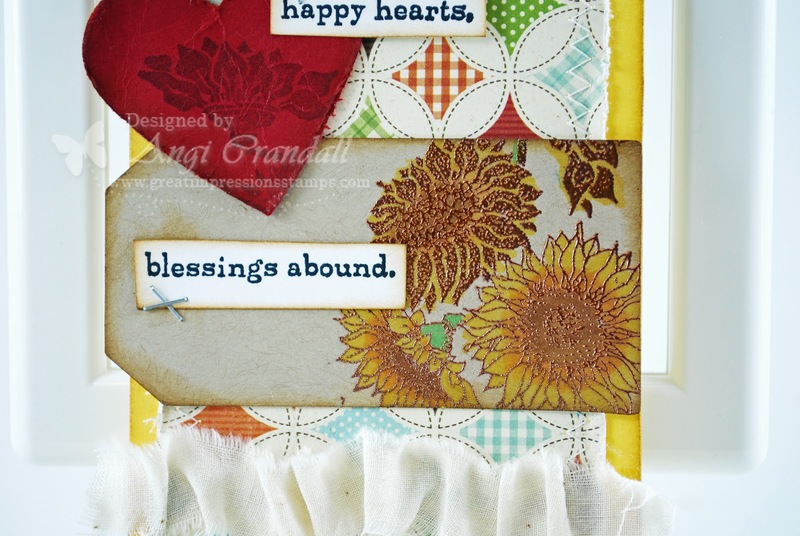 Hey Angi...I just love Sunflowers and just love what you have created with this stamp!